Product Information : The Laguna Square Water Bowl's multifunctional nature allows you to enjoy a small water feature indoors or outdoors. 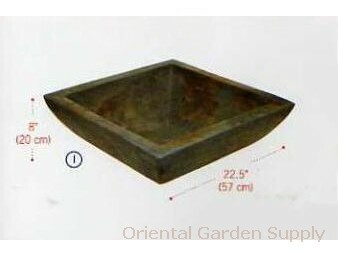 This basin is a lightweight fiberglass polyresin made to look exactly like slate with its beautiful earth tones. Measures 8in deep x 22.5 in wide. Great for a sunroom, foyer, patio or deck! Includes bottom plug, drain, and water tube for electrical connections.